The Tiger Hill lies about 3.5 kilometers to the northwest of Changmen Gate, Suzhou City. Known as the best view of southern Jiangsu Province and northern Zhejiang Province, it was originally called Haiyong (sea surge) Mountain, 36 meters high and covering some 20 hectares. The grave of He LÃ¯Â¿Â½Ã¯Â¿Â½, one of the five greatest kings during the Spring and Autumn Period (770-476BC) is in the Tiger Hill; Qin Emperor Shihuang (249-210BC), the first emperor of China, used to climb up onto the mountain for watching its fantastic views; Xiang Yu (232-202BC), the ruler of west Chu state, gathered together his troops to rebel against the Qin Dynasty (221-206BC) in the Tiger Hill; when Bai Juyi (772-846), the famous poet of the Tang dynasty (618-907), once acted as the prefecture governor of Suzhou City, he organized people to draw water through the mountain and build a causeway so that the Tiger Hill became even more beautiful. Ancient people believed the Tiger Hill had nine great scenes: moon, snow, rain, fog, early spring, summer, fall, falling leaves, and sunset. The Duanliang Palace in the Tiger Hill has a history of more than 600 years. It is characterized by the beam across the middle roof, which is made of two unconnected wooden rods. That is the reason the palace is called Duanliang (broken beam). Not a single nail can be found in the construction of the palace, which is joined together all through tenons. The spring is still clear and sweet after over 1,000 years. It is said the spring water can cure eye illness. 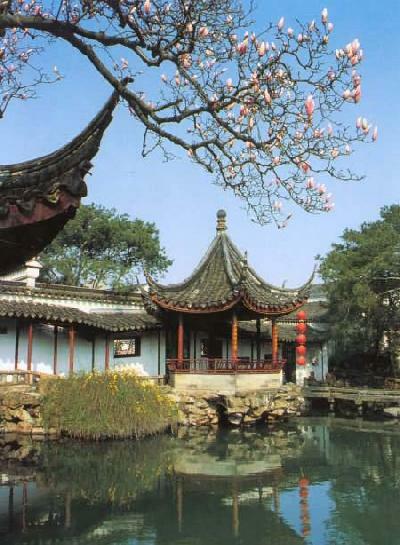 The tower has a history of more than 1,000 years, and now becomes a symbol of the ancient Suzhou City. The Sword Pool is the most interesting place in the Tiger Hill. According to the records, King He Lv was buried under the pool. It is called the Sword Pool because He Lv's favorite golden sword was buried together with him under the pool. 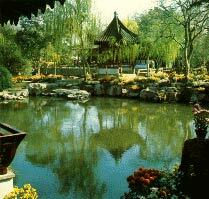 It is a small park in the mountain, built in the late Qing Dynasty (1644-1911). Though it is not large, it is very elegant and pretty.